ProModeler - 110oz-in, Mini, CLS #DS110CLHV Better parts. Better servos. The formula is simple. Of the mini-class servos in the CLHV family, the DS110CLHV is the fastest - 110 oz-in of torque and transiting a 60° arc in 0.035 seconds . . . this redefines fast! When is fast important? Maybe you're outfitting a 422 Q-40 or 426 Q500 pylon racer (because you're one of those God equipped with the superhuman reflexes). Or you're Jonesing a gyro equipped 60" class 3D model for the ultimate in low level aerobatic capability. Sure, 110oz-in is probably twice as much torque as you need, but the reason you want this servo is for 60°/0.035 seconds. Beyond über fast, it delivers when cutting inside a competitor at turn 1, or for executing a waterfall down to 6" before powering out. If you're seeking an edge . . . you've just found one! Especially important for racing are servos built to an aerospace standard. For example, racing engines transmits power impulses throughout the air frame at 23K RPM. This intense vibration can kill servos. The DS110CLHV is tested to MIL-STANDARD 810G Test Method 514.6 (vibration), offering another edge hobby-grade servos can't deliver. How important is better vibration protection? Yeah, we think that way also. What if you're outfitting a 500-class 3D-heli? Since cyclic-servos plug directly into a flybarless 3D-gyro - ahead of the receiver - this means corrective inputs are generated by the MEMS sensors (and significantly faster than human response). This is why top pilots use the fastest servos they can find. After all, performing piro-flips and tick-tocks so low the tail rotor nearly touches the ground means a crash happens in a flash so faster reacting servos may mean the difference between cheers, and an expensive dirt nap, right? Since there are three servos on the swashplate, one servo alone outputs more than your entire model weighs. This means 110oz-in is overkill. And since a faster servo means 3D maneuvers happen more quickly, this is the servo you want for maneuvers that stop and start in an instant. Plenty of torque, and faster means the rest of the features are icing on the cake because for you, it's all about better performance. With respect to centering, due to the genuine Japanese Nobel potentiometer (the best money can buy) along with MIL-SPEC components, you get the best centering in the industry. And since the case is made of CNC-machined aircraft aluminum - plus impact resistant engineering polymer reinforced with bronze bushings at the steel gear shafts pockets - you get lust-worthy light weight plus slop-free performance that endures season after season. Better components. Better servos. The formula is simple. 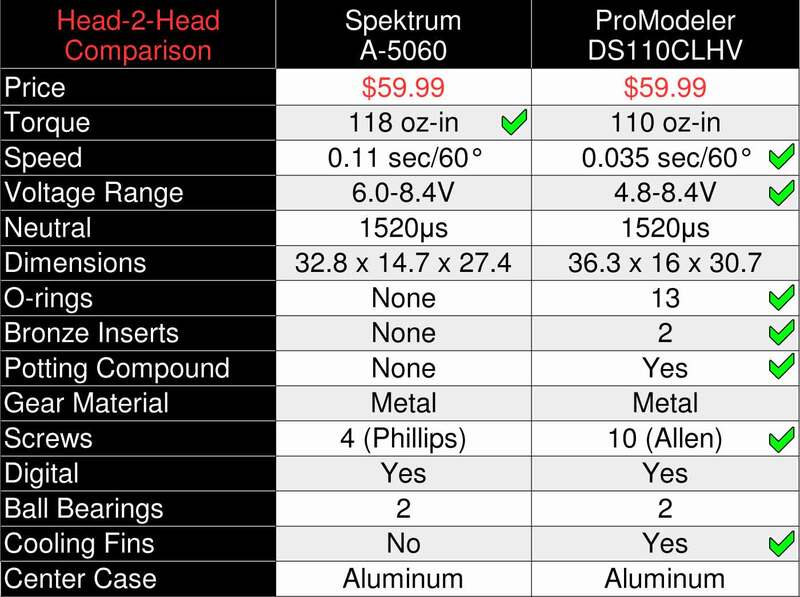 Decisions regarding what go into ProModeler servos aren't made in accounting to optimize price and profit, but in engineering. The reasonable price comes about because we reject the importer + distributor + hobby dealers business-model because they each get a cut at your expense. With ProModeler you're cutting out the middlemen by dealing direct. The foundation is the center case that's made from a solid billet of 6061-T6 aircraft aluminum. It's CNC-machined with cooling fins for better cooling. The upper and lower case components are injection molded of impact resistant nylon 6.6 (a fiber-filled engineering polymer like what's used in Glock handgun frames). In the interest of durability, plastic case components are further reinforced with bronze bushings (at the pockets where the steel gear shafts fit). So as not to reinvent the wheel, the output shaft spline is 25T (Futaba-compatible). For durability, the gear train is all metal, and it's equipped with dual ball bearings. For protection against destructive vibration, the PCB (printed circuit board) is coated with epoxy potting compound. The entire assembly is sealed against the elements with thirteen (13) Buna-N synthetic O-rings. Finally, while there are ten (10) screws in the assembly, for increased rigidity, the upper case (the one housing the gears, e.g. the transmission section) is secured with six (6) screws instead of four. Moreover, you get hardened (grade 12.9) Allen-head M2 socket cap screws instead of Phillips. Specifications (performance, mechanical, electrical, and line drawings) are contained within the Specs TAB and if you're curious how this servo matches up to competing products, check out the Comparison TAB where we help with your homework. Last thing, if you're a 3D pilot and you'll trade off some speed for a bunch more torque, then consider our DS160CLHV (160oz-in vs. 110oz-in) because it transits in a mere 0.06sec/60°, which is plenty fast by pretty much any measure. Especially considering we are only competing with ourselves because the other brands can't! Finally, if brushless motor digital servos are more your cup of tea, then you may wish to consider our DS160BLHV and DS085BLHV (this last one is 760μs neutral so it's for tail rotor gyroscopes only). With bullet-proof all-aluminum construction, these servos may better suit you needs. There are plenty of competitors, but none are faster or stronger. And while one costs less and two cost the same, the rest cost more! Thing is, none are built as well as the DS110CLHV - and it's not even close. Strong statement? Yup, but we can prove it. First, scan down the list and see a comprehensive feature comparison (on a servo-by-servo basis) of the servos listed (alphabetically) below. Next, peruse the TL:DR TAB for the details of how our servo is built and judge for yourself. Last thing, if you're considering a competing mini-class servo, which isn't on this list, please let us know and we'll be happy to create the Head-2-Head comparison for you! I put these servos in my 64in Extreme Flight MXS and all I can say is wow! These are the fastest, most accurate servos I have come across for these 60in planes and at a very fair price as well. Also, I have spoken to the owner of ProModeler a few times now and you would be hard pressed to find someone that stands behind their product as well as he does. Great servos and a great company to work with! Do yourself a favor and try these out on your next 60in build. Great little servo - fast and strong! I recently purchased a DS110CLHV servo to use as a throttle servo on a DA-35. It's fast and strong resulting in great control. I couldn't be more pleased and will no doubt be using this servo not only for throttles but as a general servo in smaller planes.